Politician. Populist. Born: September 10, 1831. Died: October 6, 1912. Served in U.S. Senate: March 4, 1891, to March 4, 1897. 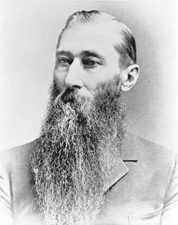 Populist William Peffer was the first non- Republican to serve as a U. S. senator from Kansas. Born in 1831, Peffer left Pennsylvania and settled in Fredonia in 1870. He soon took up journalism and eventually moved to Topeka where he became editor of the Kansas Farmer. Peffer remained active in state politics until retiring to his home at Grenola, Wilson County, where he died in October 1912.